Welcome to the 2019 spring edition of the MAGMAacademy newsletter, we hope you enjoy reading it! With lots of fun, we are currently preparing GIFA International Foundry Trade Fair in Düsseldorf. Once again, the MAGMAacademy will have its own booth area in Hall 12. We cordially invite you to come and find out about our worldwide program for further education. Moreover, look forward to getting exciting insights into topics around virtual optimization and the efficient use of MAGMASOFT®. Have fun and demonstrate your skills by beating MAGMASOFT® autonomous engineering at designing a casting system. Use the virtual drawing board at our booth to test in five minutes whether your ideas lead to the optimal solution and become MAGMASOFT® Champion! Besides the preparations for GIFA, here. If you are a MAGMASOFT® look out for news from the support section of our website. featured at the end of today’s article. Please feel free to contact us if you have individual questions. Happy Easter to you and kind regards from Aachen! This is not only the topic we focus on at GIFA in Düsseldorf, but also the main focus of our training “Virtual Design of Experiments and Optimization”. 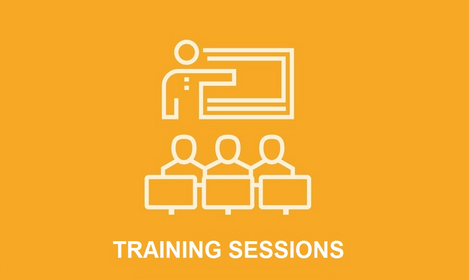 In this training, you learn strategies for systematically optimizing production engineering, make use of results as a basis for reliable predictions and thus unlock new potentials for saving time and costs. What is the appropriate approach for optimizing your casting processes and validating the casting quality? Simulation-aided process optimization requires profound knowledge of the possibilities and use of virtual design of experiments. For the casting shown in Figure 1, you can clearly see that, at the end of solidification, there are hot spots as well as liquid melt resulting from them in the casting (image to the left). This is confirmed by the porosity distribution revealed in the image to the right. The aim is to find out how to prevent the solidification porosity in the casting below the feeders with the help of a virtual design of experiments. In the training, you systematically develop different variants to improve the feeding of the casting and make appropriate adjustments if necessary. You analyze the influence of different chills, change the feeder size, vary the cooling capacity of the core sand and define different pouring temperatures. From the resulting number of different variants (designs), a design of experiments is created; finally, a total of 32 designs are automatically simulated. Figure 2: Deciding which design to choose with the help of the parallel coordinate plot. Evaluating and selecting good variants is based on quantitative values of different quality criteria. The assessment options allow you to identify a robust compromise from different criteria. 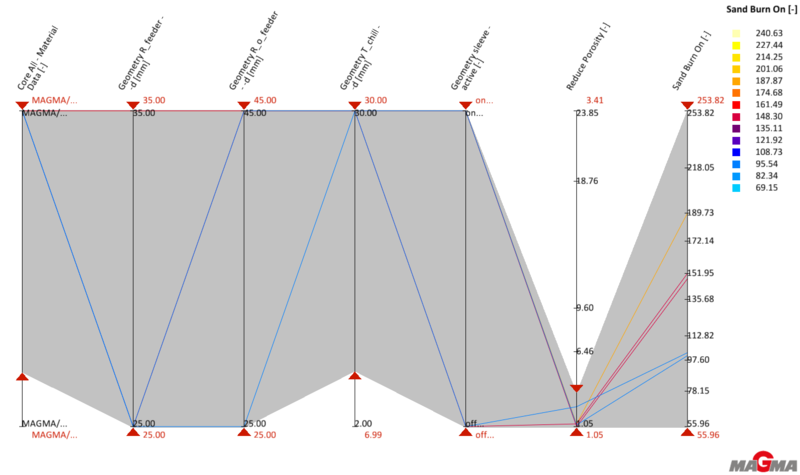 Making use of the parallel coordinate plot is the easiest and fastest way to identify mutual effects for all variables and thus make reliable decisions. If you wish to learn more about this topic, make sure to attend our training Virtual Design of Experiments and Optimization Using concrete examples in sand, permanent mold or high pressure die casting, you will learn how to systematically work on optimization projects: from the set-up/ preparation of parametric geometries, over the definition of virtual experiments, up to the detailed discussion of different quality criteria. Moreover, we will show you how to make optimal use of the systematic result analysis and the resulting conclusions for your production process. 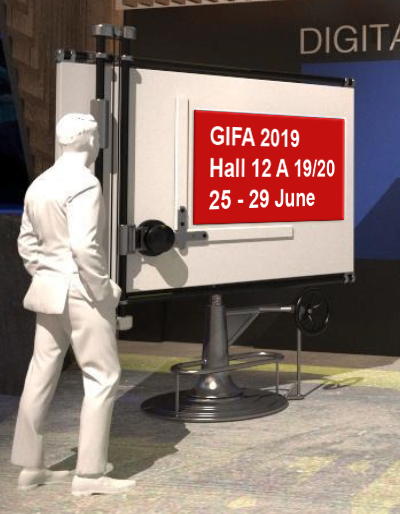 Come and visit us at GIFA in Düsseldorf, in Hall 12, Booth 12 A 19/20! We look forward to seeing you there!.